As in many transition economies, China’s legal infrastructure and enforcement is poor. A weak self-regulatory system and inefficient law enforcement makes it easy for controlling shareholders to manipulate control rights and maximize their own benefit, rather than that of investors. This new book is the first to address the serious ‘tunneling’ or expropriation of minority shareholders by large shareholders in China’s listed companies. minority shareholders, who often suffer from expropriation and tunneling and require access to legal remedies. Using a law and economics approach, the work sets out the current problems, and offers you solutions. It analyses the types of pervasive misconduct of large shareholders in China’s listed companies, and suggests concrete reform proposals toward effective protection of minority shareholders in the areas of regulation, enforcement, and the judiciary. These reforms include recognizing the fiduciary duty of controlling shareholders, improving voting rights for minority shareholders, enhancing the disclosure system, and restricting insider trading and market manipulation. How to develop an investor protection-oriented regulatory system through the integration of legal transplants and indigenous legal resources. This in-depth analysis will be essential reading for multinational corporate counsel, as well as for anyone interested in Chinese markets – whether from a legal or a business standpoint. CHAPTER 1 An Overview of China’s Stock Market. 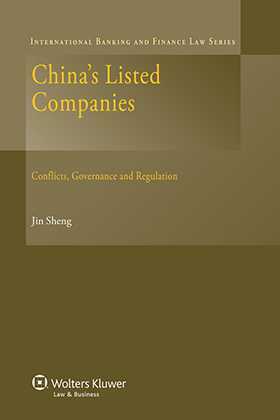 CHAPTER 3 China’s State-Owned Listed Companies: Conflict of Interests and Institutional Settings. CHAPTER 4 Family Controlled Listed Companies: CMS in Group Affiliates. CHAPTER 7 Evolution of CSRC’S IPO System (1992-Present). CHAPTER 8 Exchange Policy and Openness of Stock Market. CHAPTER 9 Investor Protection: A Perspective of Lawmaking. CHAPTER 10 China’s Securities Watchdog. CHAPTER 11 The Role of People’s Courts in Private Securities Litigation: Passive Courts and Weak Investor Protection.